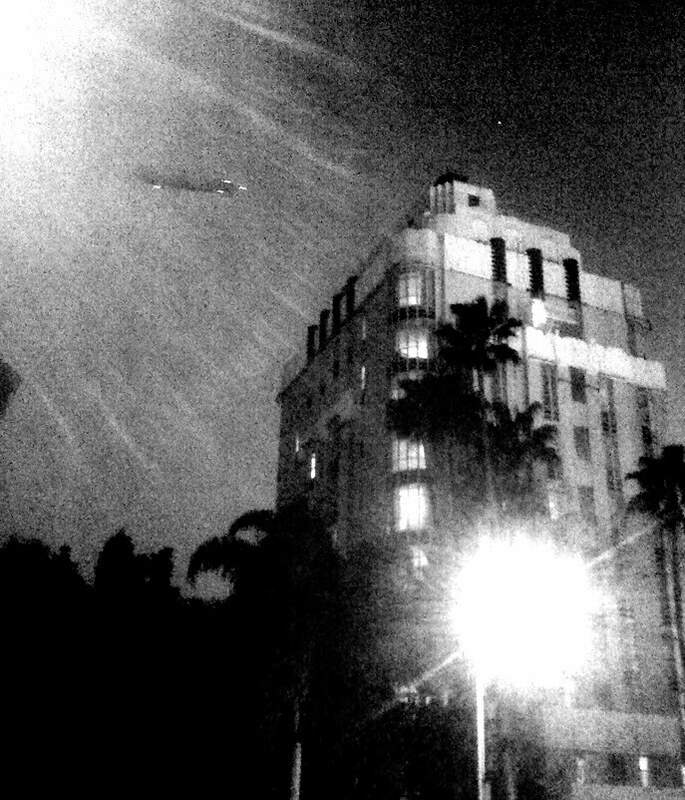 This grainy nighttime picture of a zeppelin passing over a deco hotel in Los Angeles looks like it might have been shot in the 1930s. But it actually was taken with my iPhone on Sunset Boulevard two weekends ago. Airship Eureka is the same Silicon Valley-based zeppelin that I traveled on over the summer, when it last ventured down the coast for a few days of L.A.-area tourist flights. I happened to be in town last week, too, and spotted the 246-foot, helium-filled craft several times while I was there -- in the air over Interstate 405 and above West Hollywood, and on the ground at the airport in Long Beach. Long Beach also was the destination at the end of my July flight from Eureka's home at Moffett Field near San Jose. That 9-hour, 20-minute trip offered spectacular views down most of the length of the Golden State. We also made an unexpected pass over the media swarm that had gathered near Michael Jackson's Neverland Ranch to cover the pop icon's death a few days earlier -- a test flight for the zeppelin's potential as a platform for TV crews. Photo highlights from my trip are linked here and embedded in a slideshow below. But few of those shots convey how enormous Eureka is. From the ground, it might look like the kind of blimps that often circle over sporting events. But this zeppelin -- different from a blimp because of its semi-rigid framework inside -- is closer in length to a Boeing 747 or a colossal U.S. Air Force C-5 Galaxy cargo jet. Enthusiasts of lighter-than-air vehicles such as the historic zeppelins of the early 20th century have been waiting decades for an airship renaissance. They imagine a time when aerial giants are once again common sights over big cities, if not to ferry passengers than perhaps to deliver airborne cargo to hard-to-reach destinations. Economics and aerodynamics have thwarted many such ventures over the years, as I noted in a previous posting. But those past failures aren't daunting the founders of Airship Ventures, Eureka's California operator. Company president Brian Hall is a software entrepreneur with a soft spot for technologies that "ended prematurely" or were never "fully explored." He and his wife obtained their Zeppelin NT under a long-term lease from the legendary German airship-builder. The Halls' immediate plan for their zeppelin -- one of just three such aircraft operating around the world -- was to launch a high-end "flight-seeing" business for tourists and charter passengers, supplemented by the kind of sponsorship dollars long associated with traditional blimp operations. In an in-flight interview during my flight, Hall said "healthy profits" appeared to be in reach -- probably within a year, despite the hardly buoyant economy in which the privately held enterprise lifted off in the fall of 2008. Hall also said he eventually hopes to operate an additional airship or two, including one possibly based on the U.S. East Coast. The longer-term plans for Airship Ventures are even more ambitious. Hall explained that the company's "public-facing business" -- tourism and advertising -- was designed in part to support the development of new and improved airships while also providing a showcase for their future potential. And as those vehicles become available, Hall clearly indicated he wants to be among the first in line to capitalize on their capabilities. "I don’t think it's the best airship," Hall said of Eureka as we passed a few thousand feet over the California coast south of Santa Barbara. "I think it's the best airship you can buy." What could a better airship do? Hall said improvements in propulsion and range will turn future zeppelins into fuel-efficient, stable and highly maneuverable platforms for lucrative government work -- such as aerial surveillance flights for military or homeland security missions that would benefit from an airship's ability to "loiter" for long periods over fixed points. Heavy-lift cargo assignments, especially in areas without significant infrastructure, were another possibility Hall mentioned. And the same long-distance, long-duration capabilities required for those assignments also could lead to grander travel possibilities, such as the trans-oceanic passenger flights that ended with the Hindenburg disaster of 1937. One way that Airship Ventures is trying to demonstrate the potential of current and future zeppelins is by leasing out the Eureka for scientific work -- like the kind of atmospheric research done by NASA. Conveniently the aerospace agency's Ames Research Center is the landlord for Eureka's Moffett Field hanger. And a few weeks ago, researchers from NASA's Earth Science Division at Ames hired out the airship for eight hours to test its uses as an experimental observation platform. Hall also told me he was talking to researchers from other scientific institutions about ways to take advantage of Eureka's ability to unobtrusively study whales and other marine life. A stunning overhead photograph of a blue whale recently posted on Airship Venture's Web site may help make that case. Hall said earlier airship start-ups led by entrepreneurs with similar goals and visions foundered over the years because they tried to do too much too fast. In contrast, Hall said his company was slowly cultivating the technology, know-how and market for innovative new lighter-than-air craft. "We're building a foundation," he said. As Hall and I finished our interview, I rejoined the handful of other passengers, taking in views of Malibu and the passing coastline out the port-side windows of Eureka's 30-foot gondola. A short time later, we soared over Santa Monica Pier and into the heart of Los Angeles. We watched jumbo jets land below us as we passed over busy LAX. And a few of us took turns snapping pictures of each other sticking our heads out one of the windows -- not something you can do on many other aircraft these days. As we neared Long Beach, one of our two pilots -- Fritz Guenther, on loan from the airship's manufacturer -- provided some last-minute instructions to the passengers about the arrival procedures. We applauded -- perhaps prematurely. "We're not done yet," Guenther reminded us. "We have to land." But after that flight, it was hard not to be a little enthusiastic. Reality is for the earthbound. I enjoyed reading your blog post. I also simply appreciated it; the airship industry needs the "story" to be told far more than to develop technologies. Airships will return, and will make a huge impact on aviation. Articles such as yours will help. Thank you! I do like how the link to the size comparison chart at Airship Ventures provides the passenger capacity of the Giant Squid, which happens to be 1.2. Good to know.